Citation Information: J Clin Invest. 2006;116(12):3085-3085. https://doi.org/10.1172/JCI30766. Citation Information: J Clin Invest. 2006;116(12):3086-3086. https://doi.org/10.1172/JCI30574. Citation Information: J Clin Invest. 2006;116(12):3087-3087. https://doi.org/10.1172/JCI30767. Citation Information: J Clin Invest. 2006;116(12):3088-3088. https://doi.org/10.1172/JCI30698. Citation Information: J Clin Invest. 2006;116(12):3088-3089. https://doi.org/10.1172/JCI30738. Citation Information: J Clin Invest. 2006;116(12):3090-3100. https://doi.org/10.1172/JCI30163. HDL metabolism represents a major target for the development of therapies intended to reduce the risk of atherosclerotic cardiovascular disease. HDL metabolism is complex and involves dissociation of HDL apolipoprotein and HDL cholesterol metabolism. Advances in our understanding of the molecular regulation of HDL metabolism, macrophage cholesterol efflux, and HDL function will lead to a variety of novel therapeutics. Citation Information: J Clin Invest. 2006;116(12):3101-3103. https://doi.org/10.1172/JCI30663. Prion disease refers to a group of fatal transmissible neurodegenerative diseases for which no pharmacological treatment is available. The cellular prion protein (PrPC) is required for both prion replication and pathogenesis, and reducing PrPC levels has been shown to extend survival time after prion infection. RNA interference (RNAi) is a sequence-specific posttranscriptional gene silencing mechanism. In this issue of the JCI, Pfeifer et al. report that lentivector-mediated RNAi significantly reduced neuronal PrPC expression; effectively suppressed accumulation of the infectious protease-resistant form of PrP (PrPSc) in a persistently infected neuroblastoma cell line; and markedly slowed the progression of prion disease in a unique chimeric mouse model (see the related article beginning on page 3204). These findings indicate that lentivector-mediated RNAi could, in principle, be developed for the therapy of prion disease. Citation Information: J Clin Invest. 2006;116(12):3103-3106. https://doi.org/10.1172/JCI30666. An increase in adipocyte number is a major contributor to the increase in adipose tissue mass that is characteristic of obesity. The identity and regulation of the adipocyte precursor cell (or preadipocyte) and the preadipocyte precursor cell (or progenitor cell) have been intensely studied for many years. In this issue of the JCI, Crossno et al. report that progenitor cells originating from outside the adipose tissue, in particular the bone marrow, can contribute to an increase in adipocyte number (see the related article beginning on page 3220). Their study in mice reveals that treatment with the thiazolidinedione rosiglitazone or exposure to a high-fat diet promotes the trafficking of circulating bone marrow–derived progenitor cells into adipose tissue, where they become multilocular adipocytes. This adds a new and unexpected dimension to this research arena. Citation Information: J Clin Invest. 2006;116(12):3106-3108. https://doi.org/10.1172/JCI30664. Neutrophil infiltration into the lung is considered a crucial step in the pathogenesis of acute lung injury, yet data on the underlying mechanisms have been ambiguous: although selectin-mediated leukocyte rolling is absent in lung capillaries, therapeutic strategies targeted at selectin-mediated cell-cell interactions yield partial protection. The study by Zarbock and coworkers in this issue of the JCI solves this apparent contradiction by identifying selectin-mediated platelet-neutrophil interaction as a critical step in the mutual activation of leukocytes and endothelial cells (see the related article beginning on page 3211). The emerging role of platelets may be of broad clinical relevance in lung inflammatory disorders, including asthma, chronic obstructive pulmonary disease, and cystic fibrosis. Citation Information: J Clin Invest. 2006;116(12):3108-3110. https://doi.org/10.1172/JCI30760. In healthy individuals the immune system does not react aggressively toward host cells, a phenomenon defined as self tolerance. If self tolerance is broken autoimmune disease can develop, during which autoreactive lymphocytes are directed to a variety of autoantigenic epitopes. However, researchers have yet to determine whether immune responses to multiple autoantigens develop independently of each other or are the result of the response “spreading” from one autoantigen to another. In a study of NOD mice in this issue of the JCI, Krishnamurthy et al. show that the autoreactive T cell response to the autoantigen proinsulin lies upstream of that to islet-specific glucose-6-phosphatase catalytic subunit–related protein, suggesting that the pathogenic autoimmune response to proinsulin subsequently spreads to other antigens (see the related article beginning on page 3258). These data support the current view that this pancreatic β cell hormone is the first autoantigen targeted by the immune response in autoimmune diabetes. Citation Information: J Clin Invest. 2006;116(12):3111-3113. https://doi.org/10.1172/JCI30685. The formation of new blood vessels, a process known as angiogenesis, is important for embryonic development and wound healing as well as the development of cancer and inflammation; therefore, angiogenesis is a valuable target for clinical intervention. Both logic and empiricism suggest that a balance of stimulatory and inhibitory switches is required for orderly formation of blood vessels. Thrombospondins 1 and 2 were among the first natural angiogenesis inhibitors to be identified. However, the cellular origins and mechanisms of action of these important proteins during angiogenesis have remained largely unknown. 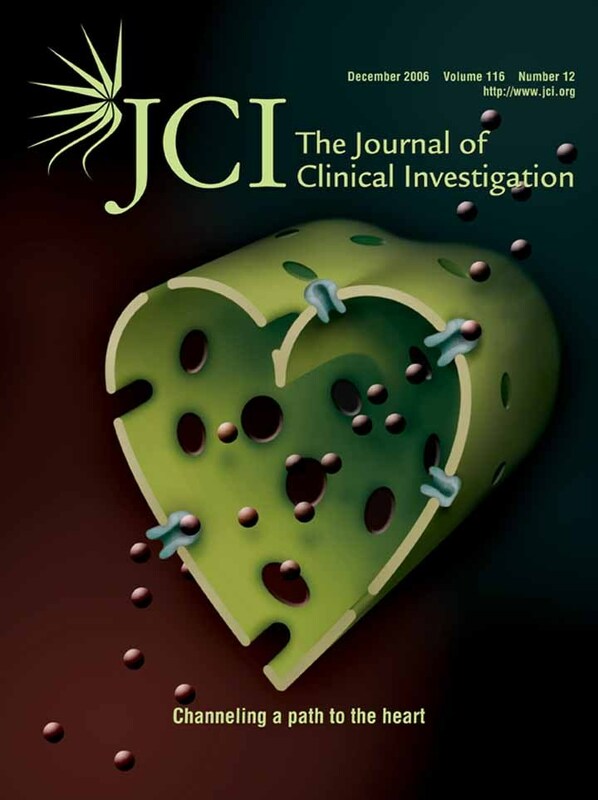 Studies by Kopp et al., presented in this issue of the JCI, clarify some of these issues by revealing that megakaryocytes and their “sticky” wound-healing progeny, platelets, are important sources of thrombospondins 1 and 2 and that these thrombopoietic cells play key roles in controlling blood vessel formation during hematopoiesis and ischemic wound healing (see the related article beginning on page 3277). Citation Information: J Clin Invest. 2006;116(12):3114-3126. https://doi.org/10.1172/JCI27702. The heart responds to injury and chronic pressure overload by pathologic growth and remodeling, which frequently result in heart failure and sudden death. Calcium-dependent signaling pathways promote cardiac growth and associated changes in gene expression in response to stress. The calcium/calmodulin-dependent phosphatase calcineurin, which signals to nuclear factor of activated T cells (NFAT) transcription factors, serves as a transducer of calcium signals and is sufficient and necessary for pathologic cardiac hypertrophy and remodeling. Transient receptor potential (TRP) proteins regulate cation entry into cells in response to a variety of signals, and in skeletal muscle, expression of TRP cation channel, subfamily C, member 3 (TRPC3) is increased in response to neurostimulation and calcineurin signaling. Here we show that TRPC6 was upregulated in mouse hearts in response to activated calcineurin and pressure overload, as well as in failing human hearts. Two conserved NFAT consensus sites in the promoter of the TRPC6 gene conferred responsiveness to cardiac stress. Cardiac-specific overexpression of TRPC6 in transgenic mice resulted in heightened sensitivity to stress, a propensity for lethal cardiac growth and heart failure, and an increase in NFAT-dependent expression of β–myosin heavy chain, a sensitive marker for pathologic hypertrophy. These findings implicate TRPC6 as a positive regulator of calcineurin-NFAT signaling and a key component of a calcium-dependent regulatory loop that drives pathologic cardiac remodeling. Citation Information: J Clin Invest. 2006;116(12):3127-3138. https://doi.org/10.1172/JCI26620. In heart failure (HF), Ca2+/calmodulin kinase II (CaMKII) expression is increased. Altered Na+ channel gating is linked to and may promote ventricular tachyarrhythmias (VTs) in HF. Calmodulin regulates Na+ channel gating, in part perhaps via CaMKII. We investigated effects of adenovirus-mediated (acute) and Tg (chronic) overexpression of cytosolic CaMKIIδC on Na+ current (INa) in rabbit and mouse ventricular myocytes, respectively (in whole-cell patch clamp). Both acute and chronic CaMKIIδC overexpression shifted voltage dependence of Na+ channel availability by –6 mV (P < 0.05), and the shift was Ca2+ dependent. CaMKII also enhanced intermediate inactivation and slowed recovery from inactivation (prevented by CaMKII inhibitors autocamtide 2–related inhibitory peptide [AIP] or KN93). CaMKIIδC markedly increased persistent (late) inward INa and intracellular Na+ concentration (as measured by the Na+ indicator sodium-binding benzofuran isophthalate [SBFI]), which was prevented by CaMKII inhibition in the case of acute CaMKIIδC overexpression. CaMKII coimmunoprecipitates with and phosphorylates Na+ channels. In vivo, transgenic CaMKIIδC overexpression prolonged QRS duration and repolarization (QT intervals), decreased effective refractory periods, and increased the propensity to develop VT. We conclude that CaMKII associates with and phosphorylates cardiac Na+ channels. This alters INa gating to reduce availability at high heart rate, while enhancing late INa (which could prolong action potential duration). In mice, enhanced CaMKIIδC activity predisposed to VT. Thus, CaMKII-dependent regulation of Na+ channel function may contribute to arrhythmogenesis in HF. Citation Information: J Clin Invest. 2006;116(12):3160-3170. https://doi.org/10.1172/JCI28996. Control of pathogens by formation of abscesses and granulomas is a major strategy of the innate immune system, especially when effector mechanisms of adaptive immunity are insufficient. We show in human listeriosis that DCs expressing indoleamine 2,3-dioxygenase (IDO), together with macrophages, are major cellular components of suppurative granulomas in vivo. Induction of IDO by DCs is a cell-autonomous response to Listeria monocytogenes infection and was also observed in other granulomatous infections with intracellular bacteria, such as Bartonella henselae. Reporting on our use of the clinically applied anti–TNF-α antibody infliximab, we further demonstrate in vitro that IDO induction is TNF-α dependent. Repression of IDO therefore might result in exacerbation of granulomatous diseases observed during anti–TNF-α therapy. These findings place IDO+ DCs not only at the intersection of innate and adaptive immunity but also at the forefront of bacterial containment in granulomatous infections. Citation Information: J Clin Invest. 2006;116(12):3171-3182. https://doi.org/10.1172/JCI29401. Anaplastic large cell lymphomas (ALCLs) represent a subset of lymphomas in which the anaplastic lymphoma kinase (ALK) gene is frequently fused to the nucleophosmin (NPM) gene. We previously demonstrated that the constitutive phosphorylation of ALK chimeric proteins is sufficient to induce cellular transformation in vitro and in vivo and that ALK activity is strictly required for the survival of ALK-positive ALCL cells. To elucidate the signaling pathways required for ALK-mediated transformation and tumor maintenance, we analyzed the transcriptomes of multiple ALK-positive ALCL cell lines, abrogating their ALK-mediated signaling by inducible ALK RNA interference (RNAi) or with potent and cell-permeable ALK inhibitors. Transcripts derived from the gene expression profiling (GEP) analysis uncovered a reproducible signature, which included a novel group of ALK-regulated genes. Functional RNAi screening on a set of these ALK transcriptional targets revealed that the transcription factor C/EBPβ and the antiapoptotic protein BCL2A1 are absolutely necessary to induce cell transformation and/or to sustain the growth and survival of ALK-positive ALCL cells. Thus, we proved that an experimentally controlled and functionally validated GEP analysis represents a powerful tool to identify novel pathogenetic networks and validate biologically suitable target genes for therapeutic interventions. Citation Information: J Clin Invest. 2006;116(12):3183-3194. https://doi.org/10.1172/JCI28756. Bronchus-associated lymphoid tissue (BALT) was originally described as a mucosal lymphoid organ in the lungs of some species. However, while the lungs of naive mice and humans typically lack BALT, pulmonary infection in mice leads to the development of inducible BALT (iBALT), which is located in peribronchial, perivascular, and interstitial areas throughout the lung. Here we investigated whether iBALT forms in patients with a variety of interstitial lung diseases. We show that while iBALT can be found in the lungs of patients suffering from multiple diseases, well-developed iBALT is most prevalent in patients with pulmonary complications of RA and Sjögren syndrome. In these patients, iBALT consisted of numerous B cell follicles containing germinal centers and follicular dendritic cells. A loosely defined T cell area surrounded the B cell follicles while lymphatics and high endothelial venules were found at the B cell/T cell interface. Increased expression of lymphoid-organizing chemokines, such as CXCL13 and CCL21, as well as molecules involved in the immunopathology of RA, such as B cell–activating factor of the TNF family (BAFF), ICOS ligand, and lymphotoxin, correlated with more well-developed iBALT. Finally, the presence of iBALT correlated with tissue damage in the lungs of RA patients, suggesting that iBALT participates in local RA pathogenesis. Citation Information: J Clin Invest. 2006;116(12):3204-3210. https://doi.org/10.1172/JCI29236. Prion diseases are fatal neurodegenerative diseases characterized by the accumulation of PrPSc, the infectious and protease-resistant form of the cellular prion protein (PrPC). We generated lentivectors expressing PrPC-specific short hairpin RNAs (shRNAs) that efficiently silenced expression of the prion protein gene (Prnp) in primary neuronal cells. Treatment of scrapie-infected neuronal cells with these lentivectors resulted in an efficient and stable suppression of PrPSc accumulation. After intracranial injection, lentiviral shRNA reduced PrPC expression in transgenic mice carrying multiple copies of Prnp. To test the therapeutic potential of lentiviral shRNA, we used what we believe to be a novel approach in which the clinical situation was mimicked. We generated chimeric mice derived from lentivector-transduced embryonic stem cells. Depending on the degree of chimerism, these animals carried the lentiviral shRNAs in a certain percentage of brain cells and expressed reduced levels of PrPC. Importantly, in highly chimeric mice, survival after scrapie infection was significantly extended. Taken together, these data suggest that lentivector-mediated RNA interference could be an approach for the treatment of prion disease. Citation Information: J Clin Invest. 2006;116(12):3211-3219. https://doi.org/10.1172/JCI29499. Acute lung injury (ALI) causes high mortality, but its molecular mechanisms are poorly understood. Acid aspiration is a frequent cause of ALI, leading to neutrophil sequestration, increased permeability, and deterioration of gas exchange. We investigated the role of platelet-neutrophil interactions in a murine model of acid-induced ALI. Acid aspiration induced P-selectin–dependent platelet-neutrophil interactions in blood and in lung capillaries. Reducing circulating platelets or blocking P-selectin halted the development of ALI. Bone marrow chimeras showed that platelet, not endothelial, P-selectin was responsible for the injury. The interaction of platelets with neutrophils and endothelia was associated with TXA2 formation, with detrimental effects on permeability and tissue function. Activated platelets induced endothelial expression of ICAM-1 and increased neutrophil adhesion. Inhibition of platelet-neutrophil aggregation improved gas exchange, reduced neutrophil recruitment and permeability, and prolonged survival. The key findings were confirmed in a sepsis-induced model of ALI. These findings may translate into improved clinical treatments for ALI. Citation Information: J Clin Invest. 2006;116(12):3220-3228. https://doi.org/10.1172/JCI28510. Obesity and weight gain are characterized by increased adipose tissue mass due to an increase in the size of individual adipocytes and the generation of new adipocytes. New adipocytes are believed to arise from resident adipose tissue preadipocytes and mesenchymal progenitor cells. However, it is possible that progenitor cells from other tissues, in particular BM, could also contribute to development of new adipocytes in adipose tissue. We tested this hypothesis by transplanting whole BM cells from GFP-expressing transgenic mice into wild-type C57BL/6 mice and subjecting them to a high-fat diet or treatment with the thiazolidinedione (TZD) rosiglitazone (ROSI) for several weeks. Histological examination of adipose tissue or FACS of adipocytes revealed the presence of GFP+ multilocular (ML) adipocytes, whose number was significantly increased by ROSI treatment or high-fat feeding. These ML adipocytes expressed adiponectin, perilipin, fatty acid–binding protein (FABP), leptin, C/EBPα, and PPARγ but not uncoupling protein–1 (UCP-1), the CD45 hematopoietic lineage marker, or the CDllb monocyte marker. They also exhibited increased mitochondrial content. Appearance of GFP+ ML adipocytes was contemporaneous with an increase in circulating levels of mesenchymal and hematopoietic progenitor cells in ROSI-treated animals. We conclude that TZDs and high-fat feeding promote the trafficking of BM-derived circulating progenitor cells to adipose tissue and their differentiation into ML adipocytes. Citation Information: J Clin Invest. 2006;116(12):3229-3239. https://doi.org/10.1172/JCI29867. The gut hormone ghrelin targets the brain to promote food intake and adiposity. The ghrelin receptor growth hormone secretagogue 1 receptor (GHSR) is present in hypothalamic centers controlling energy metabolism as well as in the ventral tegmental area (VTA), a region important for motivational aspects of multiple behaviors, including feeding. Here we show that in mice and rats, ghrelin bound to neurons of the VTA, where it triggered increased dopamine neuronal activity, synapse formation, and dopamine turnover in the nucleus accumbens in a GHSR-dependent manner. Direct VTA administration of ghrelin also triggered feeding, while intra-VTA delivery of a selective GHSR antagonist blocked the orexigenic effect of circulating ghrelin and blunted rebound feeding following fasting. In addition, ghrelin- and GHSR-deficient mice showed attenuated feeding responses to restricted feeding schedules. Taken together, these data suggest that the mesolimbic reward circuitry is targeted by peripheral ghrelin to influence physiological mechanisms related to feeding. Citation Information: J Clin Invest. 2006;116(12):3240-3251. https://doi.org/10.1172/JCI24867. Cyclic nucleotide phosphodiesterase 3B (PDE3B) has been suggested to be critical for mediating insulin/IGF-1 inhibition of cAMP signaling in adipocytes, liver, and pancreatic β cells. In Pde3b-KO adipocytes we found decreased adipocyte size, unchanged insulin-stimulated phosphorylation of protein kinase B and activation of glucose uptake, enhanced catecholamine-stimulated lipolysis and insulin-stimulated lipogenesis, and blocked insulin inhibition of catecholamine-stimulated lipolysis. Glucose, alone or in combination with glucagon-like peptide–1, increased insulin secretion more in isolated pancreatic KO islets, although islet size and morphology and immunoreactive insulin and glucagon levels were unchanged. The β3-adrenergic agonist CL 316,243 (CL) increased lipolysis and serum insulin more in KO mice, but blood glucose reduction was less in CL-treated KO mice. Insulin resistance was observed in KO mice, with liver an important site of alterations in insulin-sensitive glucose production. In KO mice, liver triglyceride and cAMP contents were increased, and the liver content and phosphorylation states of several insulin signaling, gluconeogenic, and inflammation- and stress-related components were altered. Thus, PDE3B may be important in regulating certain cAMP signaling pathways, including lipolysis, insulin-induced antilipolysis, and cAMP-mediated insulin secretion. Altered expression and/or regulation of PDE3B may contribute to metabolic dysregulation, including systemic insulin resistance. Citation Information: J Clin Invest. 2006;116(12):3252-3257. https://doi.org/10.1172/JCI29251. Loss of Treg function appears to be a critical factor in the pathogenesis of human autoimmune diseases. Attention has focused on defects of CD4+CD25high Tregs, and techniques have been developed to determine their function. In contrast, the role of Tr1 regulatory T cells, which secrete the antiinflammatory cytokine IL-10, in autoimmune disease has not been well assessed. CD46 is a newly defined costimulatory molecule for T cell activation, and CD46-costimulated human T cells induce a Tr1 Treg phenotype with considerable amounts of IL-10 secretion. Here, we examined the role of Tr1 cells in patients with multiple sclerosis (MS) by stimulating CD4+ T cells with anti-CD3 and -CD46 mAbs and measuring IL-10 secretion. There were striking defects in the induction of Tr1 cells with CD46 costimulation as measured by IL-10 but not IFN-γ secretion in patients with MS compared with healthy subjects. This loss of Tr1 cell–associated IL-10 secretion was specific to CD46 and not CD28 costimulation and was associated with an altered regulation of the CD46-Cy2 isoform that differentially regulates T cell function in a CD46-transgenic murine model. These data demonstrate a second major Treg defect in human autoimmune disease associated with the CD46 pathway. Citation Information: J Clin Invest. 2006;116(12):3258-3265. https://doi.org/10.1172/JCI29602. Type 1 diabetes (T1D) is characterized by immune responses against several autoantigens expressed in pancreatic β cells. T cells specific for proinsulin and islet-specific glucose-6-phosphatase catalytic subunit–related protein (IGRP) can induce T1D in NOD mice. However, whether immune responses to multiple autoantigens are caused by spreading from one to another or whether they develop independently of each other is unknown. As cytotoxic T cells specific for IGRP were not detected in transgenic NOD mice tolerant to proinsulin, we determined that immune responses against proinsulin are necessary for IGRP-specific T cells to develop. On the other hand, transgenic overexpression of IGRP resulted in loss of intra-islet IGRP-specific T cells but did not protect NOD mice from insulitis or T1D, providing direct evidence that the response against IGRP is downstream of the response to proinsulin. Our results suggest that pathogenic proinsulin-specific immunity in NOD mice subsequently spreads to other antigens such as IGRP. Citation Information: J Clin Invest. 2006;116(12):3277-3291. https://doi.org/10.1172/JCI29314. Thrombopoietic cells may differentially promote or inhibit tissue vascularization by releasing both pro- and antiangiogenic factors. However, the molecular determinants controlling the angiogenic phenotype of thrombopoietic cells remain unknown. Here, we show that expression and release of thrombospondins (TSPs) by megakaryocytes and platelets function as a major antiangiogenic switch. TSPs inhibited thrombopoiesis, diminished bone marrow microvascular reconstruction following myelosuppression, and limited the extent of revascularization in a model of hind limb ischemia. We demonstrate that thrombopoietic recovery following myelosuppression was significantly enhanced in mice deficient in both TSP1 and TSP2 (TSP-DKO mice) in comparison with WT mice. Megakaryocyte and platelet levels in TSP-DKO mice were rapidly restored, thereby accelerating revascularization of myelosuppressed bone marrow and ischemic hind limbs. In addition, thrombopoietic cells derived from TSP-DKO mice were more effective in supporting neoangiogenesis in Matrigel plugs. The proangiogenic activity of TSP-DKO thrombopoietic cells was mediated through activation of MMP-9 and enhanced release of stromal cell–derived factor 1. Thus, TSP-deficient thrombopoietic cells function as proangiogenic agents, accelerating hemangiogenesis within the marrow and revascularization of ischemic hind limbs. As such, interference with the release of cellular stores of TSPs may be clinically effective in augmenting neoangiogenesis. Citation Information: J Clin Invest. 2006;116(12):3292-3292. https://doi.org/10.1172/JCI21540C1. Citation Information: J Clin Invest. 2006;116(12):3292-3292. https://doi.org/10.1172/JCI24381C1. Citation Information: J Clin Invest. 2006;116(12):3293-3293. https://doi.org/10.1172/JCI26390C1.